Human Rights activists have urged the Indonesian President, Joko Widodo, to thoroughly investigate the events which occurred on Monday 8 December 2014, when Indonesian police fired at a crowd of civilians in West Papua, causing 5 teenagers to lose their lives and wounding 21 others. The position of the Indonesian government on this matter is still unclear. Human rights activists have demanded that President Joko “Jokowi” Widodo form an independent team to probe a shooting in Paniai, Papua, this week that claimed the lives of at least five civilians and wounded 21. “President Jokowi should form an impartial team to thoroughly investigate the shooting incident so as to avoid the blame game among law enforcers and civilians,” said Rev Neles Tebay, coordinator of rights group Peaceful Papua Network. The shootings occurred around 10 am on Monday [8 December 2014] when security personnel allegedly attempted to disperse a crowd that had gathered and was dancing in Karel Gobai field in Madi district, Paniai. Witnesses said the residents were performing the waita tribal dance after setting fire to a black SUV believed to belong to a group suspected of assaulting residents assembled at a Christmas event in Ipakiye village, East Paniai. Police from a nearby station arrived at the field to disperse the crowd. When the crowd continued dancing and did not disperse, the police fired into the crowd. Rev Neles said the independent team should also track down the driver of the SUV that had provoked residents. He added that the case required a clear resolution since Paniai regency had seen frequent shootings since 1969. 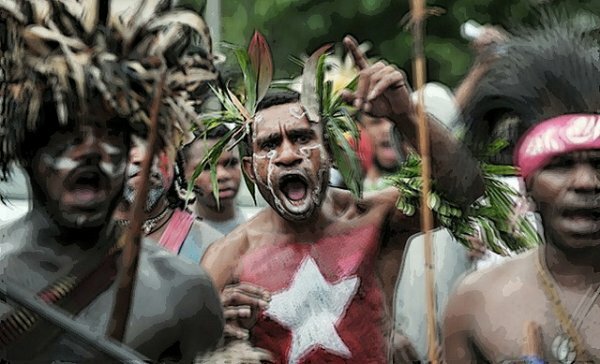 The Papua police have denied involvement in the incident, saying that before the incident occurred, residents blocked roads and disrupted traffic in Enarotali city. As the police were trying to negotiate with residents to cease the disruption, they heard gunshots from the nearby hills. The case is currently under police investigation. The Indonesian Military’s (TNI) Army chief of staff, General Gatot Nurmantyo, agreed with the police’s account of the incident and denied any TNI involvement. “As far as I know, there were no police or soldiers in the hills. However, it is known that [members of the pro-independence Free Papua Movement] often hide in the hills or the forest. We should check and investigate whether it is true or not,” he said on the sidelines of a peacekeepers departure ceremony at TNI headquarters in Cilangkap, East Jakarta. Speaking to reporters this week after accompanying President Jokowi to Halim Perdanakusuma Airport prior to his departure to South Korea, Coordinating Political, Legal and Security Affairs Minister Tedjo Edhy Purdijatno said there should be an investigation into where the bullets had come from. “The gunshots did not only come from the side but also from above. We have to see where they came from. Don’t just blame the law enforcers,” he said. Tedjo said that the situation in the area was now calm. “I’ve spoken with the [local TNI] commander and there have been talks with the local community,” he added. The rock-burning ceremony — where food is cooked with the heat of hot rocks placed in a hole in the ground covered by leaves and grass — is an age-old ritual among Papuan tribes.